Kate Hogle has worked in radio and TV sales until 1998 when she made a life changing decision of running her own business. In that year, she started Ohana Media Partners with Kit Warrington. Kate currently sits as president and Media Director of KWME, having acquired the company in 2002. Kate runs KWME with three employees. Through hard work, persistence, determination, and the foresight to grow and change with times, she has retained and grown the company’s clients, some of which have been with them for more than 26 years. MARK and CHERYL RICHARDS - Founders and Executives of Maryl Group, Inc. 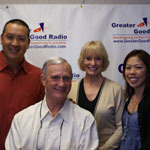 Greater Good features Mark and Cheryl Richards, founders and executives of The Maryl Group, a company that has earned an enviable reputation for master planned communities, commercial centers, custom residential homes, island architecture and impeccable construction. Edgy Lee is Hawaii’s leading female filmmaker. Edgy has appeared in various television commercials, shows, and film features in the state and the mainland. She has worked with various prominent individuals in the music and film industry including His Holiness, the 14th Dalai Lama, and the late “Godfather of Reggae” Joe Higgs. Edgy uses film and the visual media to promote Hawaii to the world and uplift the cause of the marginalized people of the Islands. She has received various accolades from a number of award-giving bodies including the Aloha Filmmakers Visionary Award at the 2005 Molokai Film Festival, Honolulu Star-Bulletin’s Ten Who Made A Difference in 2005, and Best Cinematography in the 2002 New York International Independent Film &Video Festival. At a young age of 21, Shelley Wilson decided to start her business, Wilson Homecare. She was recognized in 2003 by Pacific Business News as one of Hawaii’s 40 Under Forty, and was one of the fastest 50 companies two years in a row. Her company was also recognized in Forbes Magazine with an outstanding small business award. 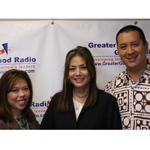 She’s actively involved with different business community organizations such as the Chamber of Commerce and the Healthcare Association of Hawaii to name a few. And she also provides international support to aid underprivileged children in Africa and Vietnam. Shelley Wilson came to Hawaii from the frigid weather of Iowa to ameliorate from an accident incurred from her military duty. Incapacitated for several years, Shelley was admitted to the Tripler Army Medical Center where she awaited full-recovery. Her humbling experience with her friends and medical staff during her convalescence galvanized her to stay in Hawaii and put up her own business veered towards care for the sick and injured. Buehler said they provide grants to small, community-based organizations that directly address the challenges facing women and girls. Instead of funding operational budgets of larger institutions, the Women’s Fund targets groups in which “a small grant would have maximum impact,” or underwrite a specific program within an organization. Leah Bernstein sits as president of Mountain Apple Company. Leah has been with Mountain Apple Company since 1980 where she began as a receptionist with only two co-workers. With her involvement, the company continues to achieve unprecedented growth every year of Mountain Apple’s existence. Leah has been involved in the music industry since she was 12, helping out with tons of paper work at the tremendously successful Dunhill Records. Leah has become a crucial instrument in the promotion of Hawaiian tunes to the rest of the world. 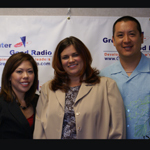 RAYNETTE TINAY - President and Chief Executive Officer of C&J Telecommunications, Inc.
Raynette Tinay is president and chief executive officer of C&J Telecommunications, Inc. Raynette runs and operates the largest call center in Hawaii. 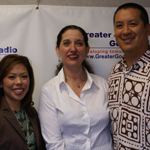 She fulfills her double bottom line by providing pro bono call center service to non-profit organizations, which have included Easter Seals Hawaii and Abilities Unlimited to help them in their fundraising efforts. Despite only reaching the 7th grade, Raynette has strived to learn about the various aspects of life and living. She has gathered inspiration from her family and close friends to become a successful businesswoman and community leader. Leslie Wilcox sits as president and chief executive officer of PBS Hawaii. Leslie holds more than 30 years of professional experience in journalism. She is a graduate of the prestigious Poynter Institute, and has spearheaded various community initiatives including the Lokahi Giving Project. Leslie has won various awards in line with her profession and as a community volunteer. These include the Outstanding Community Service award 2007 from the Lions Club of Wahiawa, Outstanding Volunteer of the Year 2005 from Salvation Army (Hawaii), and the “EMMI” Award for Community Service 2005 from Emmis Communications Corporation. The table has turned around for the second time. 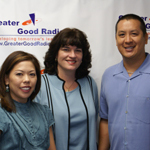 Guest-host Darren Kimura of Energy Industries shares the microphone with Evan and Kari Leong to take a look at the growth and development of Greater Good and its hosts in the past year. 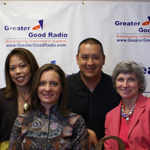 Darren compares many of the questions he had asked in the foremost Greater Good Radio special and tries to ascertain the lessons and values that Evan and Kari have learned and adopted as their own in the last 12 months of interviewing successful business and community leaders. 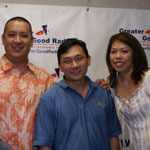 CONNIE LAU - President and Chief Executive Officer of Hawaiian Electric Industries, Inc.
Connie Lau focuses on activities where she can add value – this is her key to successfully running to large companies. Connie’s keynote position for Hawaiian Electric Industries Inc. and American Savings Bank has set the tone for her to become one of the most powerful female business leaders in the entire United States. To her, leading subordinates toward one direction, one goal is instrumental in effective governance.